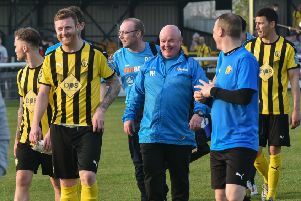 Brakes’ home Conference North campaign got off to a losing start on Tuesday night in a match that proved a fine advert for the division, writes Paul Okey. On the balance of play, few could argue Tamworth were full value for the three points. However, Leamington were left to rue two missed opportunities in the early stages of the second half which, if taken, could have changed the complexion of the match. With James Mace ruled out due to injury, Joe Magunda started in the centre of defence for the hosts, with loan signing Milan Butterfield taking his place on the bench. Former Brake Stephan Morley was at left wing-back for the visitors who silenced the home crowd in the fourth minute with a fortunate opener. Andy Burns was allowed too much time to get a shot away and the ball deflected off Connor Gudger and went in off the crossbar with Tony Breeden rooted to the spot. It might have got worse for the hosts six minutes later when Burns reacted quickest to latch on to Connor Taylor’s wayward effort but despite lifting the ball over Breeden he was unable to guide it on target. Jack Lane then should have done better with a free header from a corner, with Darryl Knights dragging his shot wide after the ball was half-cleared. Leamington finally got a foothold in the game as the clocked ticked into the 20th minute and Junior English hooked the ball just over the bar after latching on to a poor defensive header. A Colby Bishop header was claimed at full stretch by Shaun Rowley in the visitors’ goal before Brakes got back on level terms. English’s connection from Rob Thompson-Brown’s corner was not the best but the ball bounced up off the turf and evaded the defender on the line to make it 1-1. Knight was unable to supply the finishing touch after a neat move from the Lambs, producing an air shot from eight yards out and as the game ebbed and flowed, Brakes were left incensed at referee Ricky Watton’s failure to award a spot-kick after Obeng appeared to be brought down by Lane. Knights rattled the inside of the angle with a ferocious effort and there was an anxious moment for the home side when Breeden’s punted clearance hit the back of Reece Styche and drifted just past the angle. Rowley was then happy to gather an ambitious effort from Thompson-Brown at the second attempt as a pulsating half drew to a close. Brakes enjoyed their best spell of the game after the restart with a lovely flick from Thompson-Brown releasing Obeng who was denied by a block from Rowley. Thompson-Brown curled an effort over the bar, while at the other end, Taylor’s drilled shot through a host of bodies proved uncomfortable for Breeden. Obeng’s direct running was proving a menace for the visitors and Rowley was grateful for a defender for taking the sting out of a fierce strike from the wideman. Taylor had a couple of efforts from the edge of the box as the unrelenting pace of game continued before Leamington had their best opportunity of the half. The ball was hooked over the top for Obeng whose well-struck shot was met with a strong arm at full-stretch from the visiting custodian. Burns then produced excellent control after being picked out from the left but his volley was always too high to trouble Breeden. Brakes were retreating further and further back as Tamworth started to dictate play and they were punished in the 73rd minute. The excellent Ellis Deeney picked out Aman Verma whose was left unmarked in the D and the midfielder chested the ball down before turning and firing in a low shot which just evaded the despairing dive of Breeden. The goal prompted Paul Holleran to throw on Butterfield and Kurtis Revan in place of Joe Clarke and Bishop but the double change had little effect as Tamworth managed the final stages well to pocket the three points. BRAKES: Tony Breeden, Richard Taundry, Connor Gudger, Joe Clarke (Milan Butterfield, 77), Jamie Hood, Joe Magunda (Tom James, 86), Ahmed Obeng, Callum Gittings, Colby Bishop (Kurtis Revan, 77), Junior English, Rob Thompson-Brown. Subs not used: Stefan Moore, Tom Rankin. Tamworth: Shaun Rowley, Andy Burns, Stephan Morley, Ellis Deeney, Luke Jones, Jack Lane, Regan Upton, Aman Verma, Reece Styche (Brad Reid, 67), Connor Taylor, Darryl Knights (Jed Davies, 90). Subs not used: Louis Ezewele, Matt Curley, Dexter Walters.